Everyday is an opportunity to have a blissful moment. An encounter with someone who sticks in your mind or is a start of something meaningful, being a witness of something beautiful or just having something ‘click’. Last week I added a new lens to my camera gear. It’s the Voigtlander 35mm 1,4 MC lens. It’s a tiny almost pancake-like lens and has a classic, vintage lens and aperture blade design. It’s a match made in heaven with my now vintage Leica M8. I often use the pont across the Amsterdam IJ, to sit across the water with a cup of coffee, a book and my thoughts. On the photo you can see the buildings on the left side of the futuristic Eye Theater which is on the right. That’s my place of stillness. 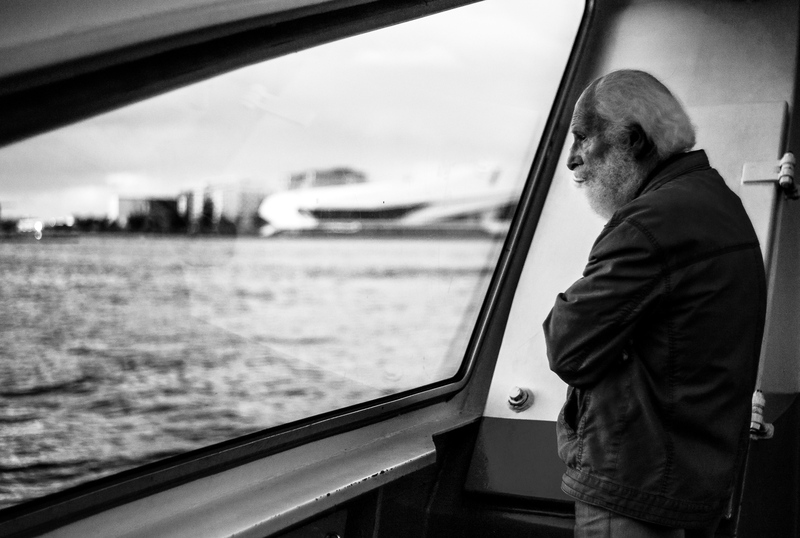 It was last week when I spotted this man, looking across the water as we waited on the pont to start the little trip to the other side of the water. I decided to grab my camera and take this shot. Due to the ancient metering system of the M8 this shot was under exposed. Correcting in post production it brings out the wonderful ‘grain’ of the Kodak CCD sensor. Combined with the nice bokeh of the lens, it produces a wonderful film-like look.